The SPARC AR is a sight that I will be reviewing later in the year. It is a durable, lightweight, compact sight which makes the perfect sight for any AR platform. 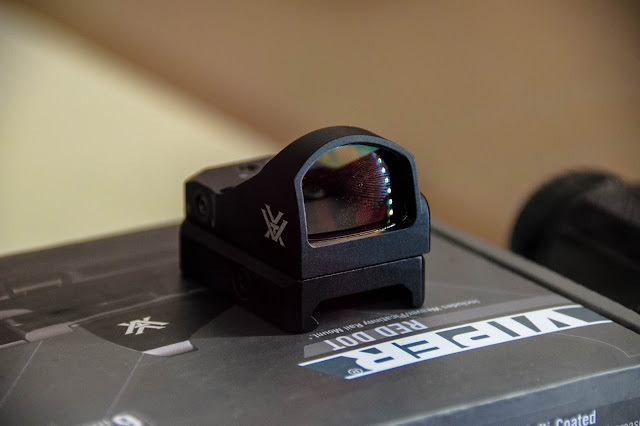 It has digital rear-facing controls that control power and dot brightness and it features a 2 MOA dot diameter which promotes a precise point of aim. Unlimited eye relief means that you always get the full picture and parallax free helps shooters hit their targets early. It is also waterproof, fogproof, shockproof and automatically shuts off after 12 hours to prevent the battery from running down. What I really love about this sight is the rubber armour that protects the sight and the tethered lens cap. The sight is super bright and I am really excited to get it to a game! 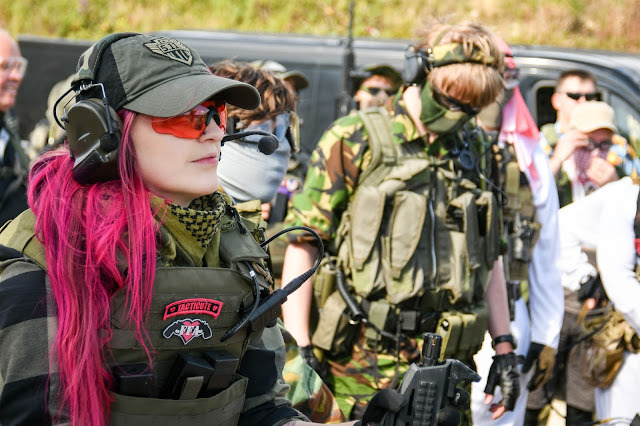 It looks similar to the T1 sights that Airsofters know and love. Another sight that caught my eye was the Venom. The Venom is the perfect low profile sight choice for an AR, Pistol or Shotgun. It comes in both 3 MOA and 6 MOA size red dot varieties for rapid target acquisition. It features a durable machined aluminium housing that helps protect the unit from whatever the shooter throws at it and the top load system makes throwing a new battery in super easy and you don't have to remove the sight to change the battery - awesome. The power and dot intensity controls are located on the left hand side of the unit for ease of access. The Venom also features a premium Wide-Field Lens. Unlimited eye relief and is parallax free. It is waterproof, shockproof, coated with a anti-reflective lens coatings and ArmorTek that helps protect the exterior lenses from scratches, oil and dirt. 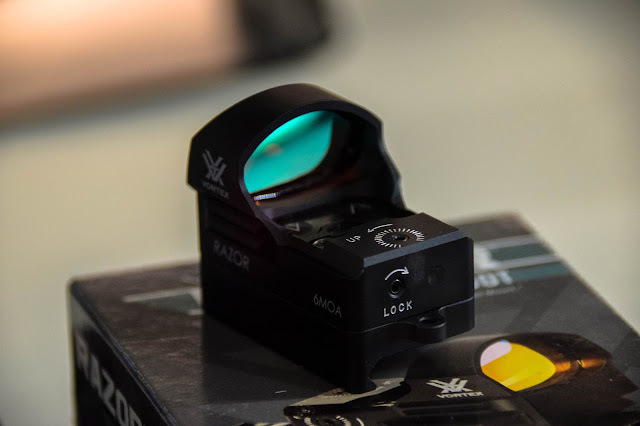 The Razor is the high end reflex sight that is built specifically built for top-tier performance - from an AR to a pistol, this is a great option for competition shooters. It is clear, accurate, compact and durable. 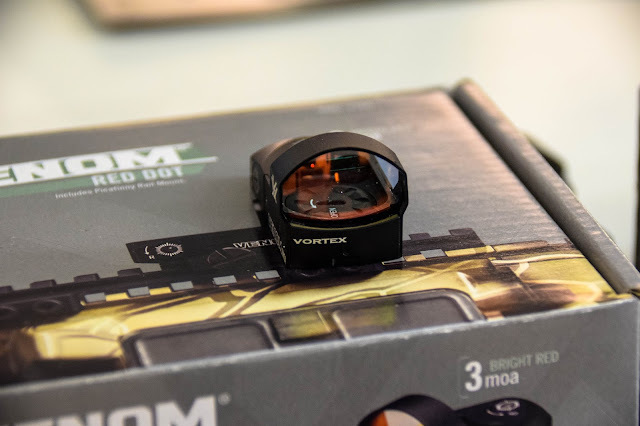 It features either a 3 MOA or 6 MOA Red Dot, is waterproof, shockproof and is coated in XR (delivers the highest level of light transmission for maximum brightness) fully multi-coated lens and ArmorTek coatings. 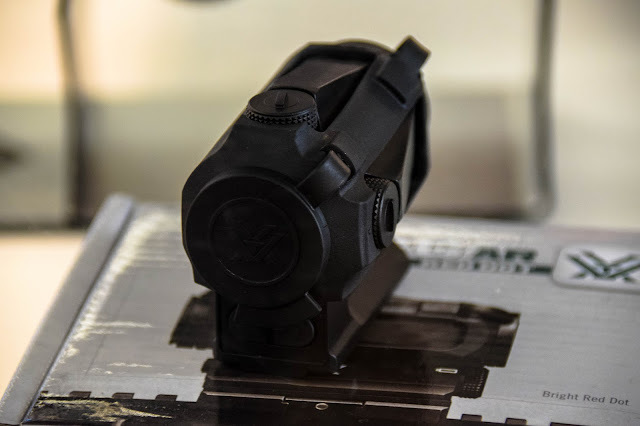 The Viper Red Dot from Vortex has a super-low mounting height which makes it the perfect solution for handguns with cut out slides. It offers shooters the accuracy, simplicity and speed advantage of a red dot sight whilst keeping the stock iron sights perfectly in view. All the controls are conveniently placed on the left hand side for ease of access.